Buyers Premium and Sales Tax: There is a 13% Buyer's Premium in effect for this auction. Location-based sales tax will also be collected for this auction. Buyers are responsible for all aspects of unloading. CH Robinson or West Auctions will not do any unloading of any kind. Buyers are responsible to have the necessary equipment to unload and remove items. All items are sold "as-is" and "where-is" with no warranties expressed or implied. 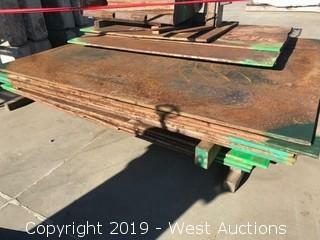 No items have been tested for working condition by West Auctions. Bidders or their Agents are responsible for ensuring they received all their items. No claims of any kind shall be allowed after Item has been delivered to the Buyer or item has been signed for after time of delivery. Buyers in default authorize West Auctions to charge a 15% re-listing fee to their credit card based upon their high bid amount. There are no refunds or exchanges. Employees are unable to assist with physical loading. Bidders are bound by all terms and conditions of this auction when the first bid is placed, therefore, Bidders should not participate in the auction if they cannot comply with the stated auction terms. Please bid accordingly. 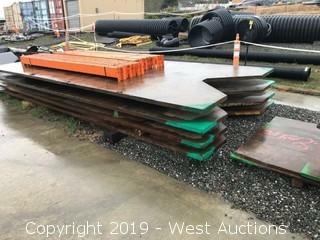 This online auction of steel road plates and intermodal plates will all be sold regardless of price. Note: Authorized Transport ONLY, NO Individual Access. Buyer is responsible for all aspects of unloading, West Auctions or CH Robinson will not do any unloading of any kind. Buyer must be equipped with all necessary tools and equipment for unloading. Page last refreshed Tue, Apr 23, 11:00pm PT.